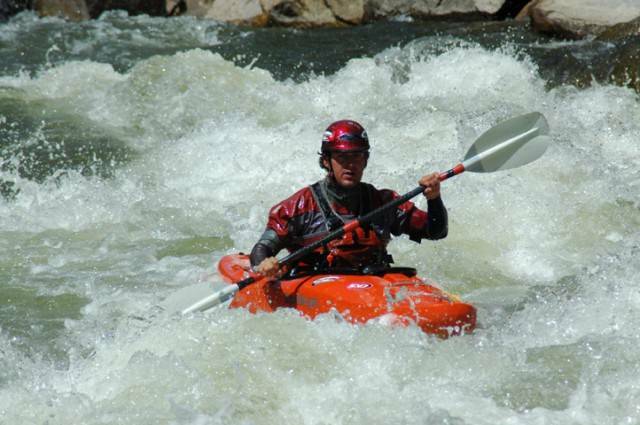 For people who regularly paddle in rough surf, river and whitewater environments, equipment is always a subject of concern. There are quite a few sources of information about how to prepare for and buy this gear – such as dry suits, helmets, paddles, and even boats and kayaks. However, just as important as the gear is the appropriate eyewear for kayaking and rafting. For successful and enjoyable outdoor boating of this kind, it is critical that good eyewear is purchased. For such athletes who are in need of corrective vision options, eyewear becomes an immediate concern. Generally speaking, there are four options: glasses, contacts, prescription goggles, and laser corrective surgery. However, because the decision to have surgery is a very personal one, and because many people disregard goggles as an uncomfortable and inconvenient option, the two most often chosen for kayakers and paddlers are glasses and contact lenses. When it comes to this debate, there is a clear choice for the average paddler: contact lenses offer corrected vision with no risk of hassles or issues that can easily arise from wearing glasses out on the river. Splash – The most obvious problem with wearing glasses in a choppy paddling environment is that splash from the river can obscure your vision. There is really no way to keep water droplets off of glasses, so while the lenses will correct your vision, you will be limited in other ways. Steam – It is quite common in an environment such as out on the river for glasses lenses to steam up as your glasses need to cope with the change in temperature between the water and the air. This can actually be a worse obstruction than splash droplets – a steamed lens can become completely opaque, which can be at the best inconvenient and at the worst dangerous. Loss – In large surf or during hole moves on the river it is not uncommon to lose your glasses. Glasses are made to fit tightly enough that they don’t fall off at random, but abrupt or violent shifts in position can still knock them out of place. You could, therefore, be inconvenienced by dropping your glasses into your boat, or, even worse, into the river! Ultimately, the above-listed inconveniences are enough to make contact lenses the logical choice for paddlers and indeed other water sport enthusiasts. In fact, to make the decision even clearer, there are even some newer models of contact lenses that are specifically designed for enhanced stability. This can be helpful while kayaking or paddling, as significant splash can knock even contact lenses out of place! If, however, you prefer prescription sports goggles see our specialty eyewear page.